Laos: I’ll be honest, I didn’t really know this country existed before I started planning the trip. Embarrassing yes, but isn’t finding out about new places what this trip is all about? Admittedly finding out about an entire new country might be verging on ignorant, but at least I know now. Did you know there was a country called Bhutan as well?? Bet you didn’t. Anyway, our first few hours in Laos were spent queuing for a visa and finding somewhere to pump the offside front (that’s the passenger side…I think) tyre up. There seemed to be no puncture so either someone let the air out of the wheel because they didn’t want to leave Thailand (let’s all turn and look at Megan at the same time) or the Michelin fairies took it… I’m sure you will agree that there can’t be any other explanation as to why a tyre would go flat for no reason. With the air pressures all now correct we pushed on to our first stop in our first communist country. 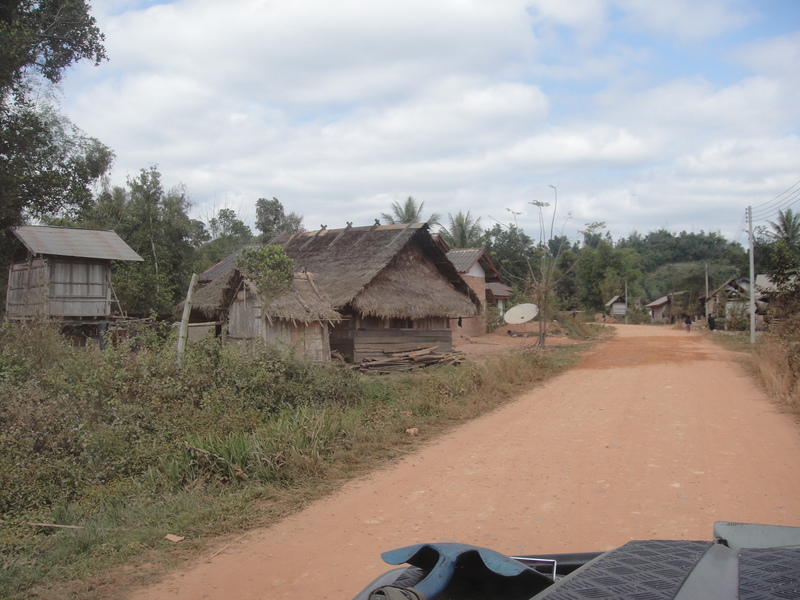 The guide book says that driving in Laos has been greatly improved now that all the roads have been surfaced. Liars. Dirty, cheating, misinforming liars! Within 30 minutes the road finished and we found ourselves driving on a rutted track with car swallowing pot holes and enough dust to block out the sun. 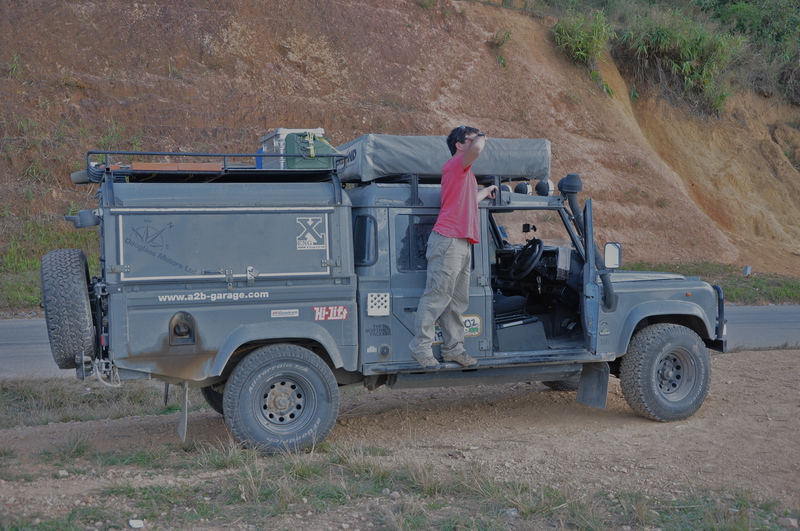 At first it was quite exciting; a bit of off roading, getting the car a bit dirty, earning some man stripes, plus for the first time on this trip bringing a Land Rover was kind of justified! but after an hour of dirt tracks, an average speed of 20mph and with another 100 miles to go the mood inside the car turned bleak. The driving was also very tiring: constantly looking for the best route through, trying to keep the car from shaking itself apart, and not hitting hysterical chickens running across the road. I failed on the last challenge and did unfortunately hit one chicken. In my defense I avoided it the first time it ran in front of us, but then it clearly felt cocky and tried its luck again!?! This time no amount of braking, swerving or swearing helped and there followed an explosion of feathers at the front of the car. Looking at each other guiltily we stopped to see if we could give the owner of the unlucky/stupid foul some money for his loss, but he simply smiled and waved us on. I get the feeling exploding chickens is the norm on these roads. We finally made it our first stop, Luang Namtha, after 4 hours of very slow driving. Laos is clearly a poorer nation than Thailand and the town we stopped at was nothing more than a street with a few shops on it and a couple of guesthouses. It was less than 100kms to the Chinese border and the place definitely had a Chinese feel to it, probably because of all the Chinese people there on holiday for Chinese New Year. It was kind of cool being so close to the border but also rather frustrating that we were unable to cross into China without having to pay silly amounts of money. We spent two nights at Luang Namtha, slowly breaking ourselves into Laos. We also took some time to catch up on a bit of maintenance and changed the break pads on the front of the car, as we had been warned that the roads were going to get steeper. Given the fact that these haven’t been changed once while I’ve owned the car, as well as the strange burning smells wafting around on the last drive we thought it best to do this sooner rather than later! Now, I don’t want to blow my own trumpet here but changing the pads was all rather easy and the task was carried out in under an hour. With the Land Rover’s previous history we both thought it would be one of those jobs where you start off thinking it’ll take 5 minutes but after 4 hours and the entire front end of the car in pieces, tools scattered everywhere and frantic phone calls back to the mechanics at Douglass Motors, it would actually take all day. Not this time though, nailed it in 47 minutes, with the addition of a few more man points for Simon. From Luang Namtha we headed for Luang Prabang, a drive of 250 kms, and 6 hours of more of the same road conditions as we had experienced on our last drive. The drives are interesting though as there is only one road running between these towns and it takes in amazing views and small insights into village life. The villages themselves are often simply a collection of bamboo huts on stilts with a single water tap to supply the whole village with their water, and most don’t even seem to have electricity. Although these people are clearly poor there is always a smile and a wave from the children and grown ups and not once have we been approached for money. I have to say that these are some of the most enjoyable days we have spent on the road. There is just so much to see, a visual feast. Driving into Luang Prabang we met Wilm and Sylvi, a German couple in a 4×4 Mercedes van doing the same sort of route as us around Laos. It’s always good to meet fellow overlanders and complain to each other about the state of the roads and petrol prices. The average backpacker just doesn’t seem to be interested in discussing the octane content of South Eastern Asian diesel, losers. We both found Luang Prabang very interesting, even if it was a bit touristy. Our hotel was a converted French colonial home and was simply beautiful. The town is a world heritage site (is there anywhere in Asia that isn’t??) and a lot of the buildings date from the time the French occupied Indochina. The majority of them have been restored and are now hotels or restaurants, and they look simply amazing. Luang Prabang’s not a cheap place though and a lot of the tourists are middle aged Europeans- no dreadlocks here, just a lot of chino wearing and pastel jumpers tied around necks, a far better type of traveler. We yet again whiled away the days wandering around the streets, monk spotting, and people watching in cafés, something of a habit with us now. We spoke to people who did not like Luang Prabang; too many people and not much to see, but in our view it was like a whole town run by the National Trust. The houses were truly stunning and we both found more than one we wanted to buy and live in! Mums would love it, or maybe we’re just getting old…. 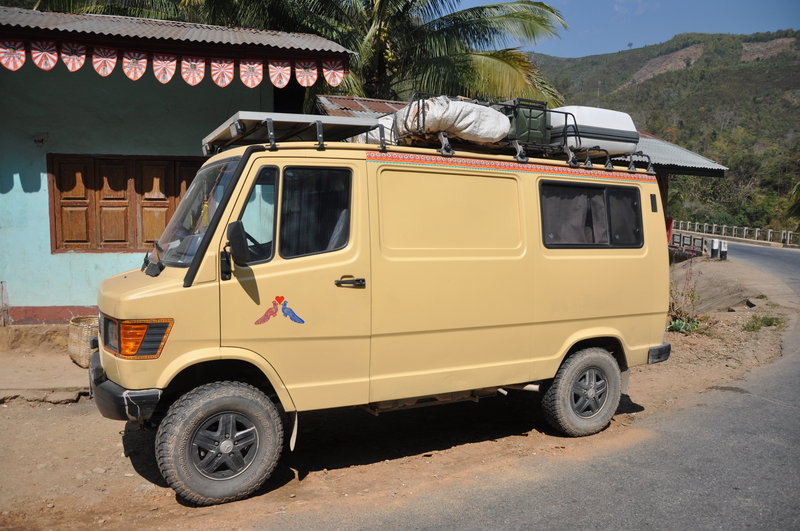 Thought you might enjoy this: we passed your truck on the street in Luang Prabang. Our kids (10 + 14) had a walk around, intrigued by the type of car, stickers, etc. p.s. 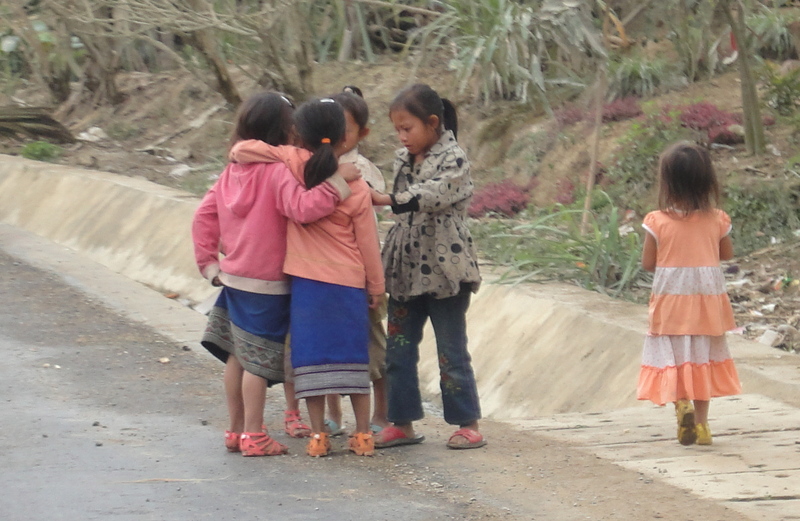 We saw you again in Vang Vieng but we rushed out of that crazy place too quickly to actually look you up + say “Hi”. we just arrived in Vientiane, wheere are you now? Would be nice to meet you somewhere in Laos. Long time since Bandar Abbas. PS: btw – we passed by the German couple in their 4×4 on our way to Thathaek 2 days ago.